The fish’s 30 in. diameter eye changes color via five concealed COLOR KINETICS ColorBlast 12 units that are programmed and controlled with a combination of ColorPlay authoring software and iPlayer 2. The color changes represent varying wind speeds and sea conditions based on the Marine Beaufort Scale, a system for estimating wind strengths without the use of instruments.Tonnesen used a relay interface board with a custom designed interface to translate an analog signal to a digital signal, which triggers the ColorBlast units.The Beaufort Scale ranges from Force 0 (calm) to Force 12 (hurricane). For example, when the eye is violet with one pulse of light, Force 1 is indicated and wind conditions are calm, or 0-1.7 mph.When the eye is green with four pulses of yellow light, Force 4 is indicated and wind conditions are moderate,or 12.1-18.9 mph.The eye reads up to Force 7 (28-33 knots or 31.7-38.5 mph).A roof-mounted anemometer provides the analog signal which is digitized and classified by a custom circuit board and the data is sent to the interface relay board,which triggers the different and appropriate color shows that Tonnesen programmed into the iplayer2s memory. All electronics are located just inside the building near the fish head. The RGB LEDs of the colorblast panels needed to be blended onto to another surface to see the mixed color,which also had to be visible in daylight.Tonnesen explained that he ordered two polycarbonate blow molded 30 in. diameter outdoor street light globes,a white translucent and a clear one to experiment with. “The white globe reflected too much daylight and dimmed the output of light from the LEDs,” said Tonnesen.“I lightly sanded the inside of a clear globe enough to mix the RGB but still be as transparent as possible. 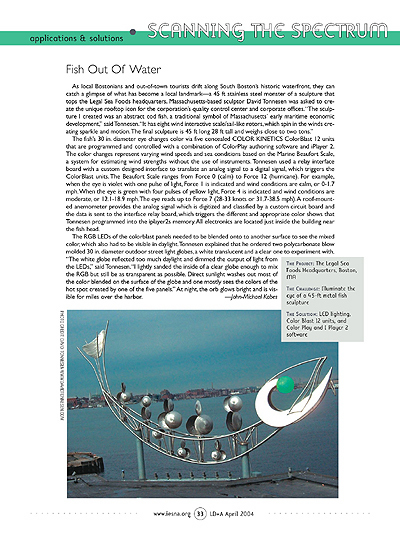 Direct sunlight washes out most of the color blended on the surface of the globe and one mostly sees the colors of the hot spot created by one of the five panels.” At night, the orb glows bright and is visible for miles over the harbor.